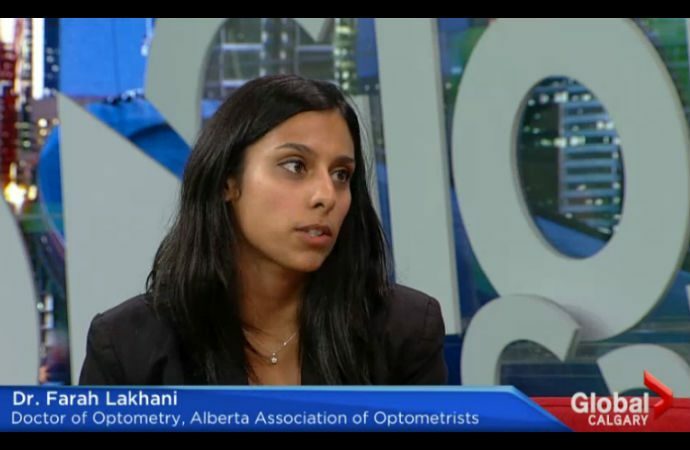 Dr. Farah Lakhani was interviewed about the importance of regular eye exams and your overall health. The interview was conducted by Bindu Suri, a Global News Host on the Global Morning News show in Calgary. Bindu: Eye exams are more important than you might think. It’s not just your vision that is tested, but eye health can affect overall health of a person. Here to talk about it is optometrist Dr. Farah Lakhani? Dr. Farah Lakhani: Lakhani, yeah. Bindu: Okay, I guessed it, because I didn’t ask you before hand. Bindu: So Farah, we were just talking a little bit about eye health and you know we all get eye exams, at least most of us do when we try to, but you’re saying – you’re talking about overall health. So what you can detect as far as – some of these are serious diseases! Dr. Farah Lakhani: They are. Bindu: What can you detect using an eye exam? Dr. Farah Lakhani: A comprehensive eye exam isn’t just about checking your vision for glasses or contacts, but it’s really about checking the health of the eyes. And what most people don’t realize is that the health of your eyes is directly connected to your overall health. So quite often, optometrists, we’re the first to diagnose underlying conditions such as diabetes, high blood pressure, aneurysms, multiple sclerosis, or even things as serious as certain forms of cancers or brain tumours. Bindu: You can tell all that from an eye exam? Dr. Farah Lakhani: From an eye exam. For instance in the case of a brain tumour, sometimes people will come in and they have part of their peripheral vision missing and they don’t even realize it. As a part of a comprehensive eye exam, optometrists, we will look at your optic nerve, we will test muscle function, make sure that there is no double vision, that type of thing, that’s often the first signs of a brain tumour. In this case, getting an eye exam, it’s more than just a vision test, but it could save your life. Bindu: And you mentioned comprehensive eye exam. Then there’s also a sight test – so those are two different things? Dr. Farah Lakhani: They’re completely different things. The sight test is just checking the vision, but the comprehensive part comes in with optometrists because we actually check the health of the eyes. And that’s where we can, through the series of procedures and tests, diagnose those underlying conditions. Bindu: So when you go in for an eye exam, do you get tested for both? Dr. Farah Lakhani: Yes, with a doctor, a comprehensive eye exam with an optometrist is both the vision and the health check. Bindu: Gotcha. Okay. We were also talking about preventative measures with eye exams. Can you just explain a little bit about what kind of things can you prevent? Dr. Farah Lakhani: Absolutely. Especially in the senior population, as we get older, it’s important to realize that our vision also starts to degenerate and deteriorate. And the leading cause of emergency room visits for seniors is because of falling – because they don’t see as well as they could be seeing. So the Alberta Injury Prevention Centre and the Alberta Association of Optometrists, we’re recommending that seniors get annual eye exams to prevent falling and hurting themselves. Bindu: Okay now how often, I imagine it would be different depending on how old you are, how often should you be getting checked? Dr. Farah Lakhani: Absolutely. Alberta Health Care actually covers eye exams when you’re 65 years and older. So we do recommend when you’re a senior, 65 and older, to get an annual eye exam. Alberta Health Care also covers eye exams for children 18 and under. For children, we typically recommend your first eye exam be between the ages of 6 to 9 months, and then at least one as a toddler between the ages of 2 and 5, and then yearly once children start school. For adults between the ages of 19 and 64, probably every two years – sooner if there are any issues. Bindu: Okay, wonderful. Such great information Farah. Thank you so much for being on the show this morning. We really, really appreciate it. Dr. Farah Lakhani: Thanks for having me. Bindu: To find out more on overall eye health and exams, you can click on optometrists.ab.ca and you can also find an optometrist in your area as well. Thanks again. Dr. Farah Lakhani: Thank you. Click here to book an appointment, for a comprehensive eye exam, with one of our Optometrists.